One of the cool features of Leopard was the addition of CalDAV support to iCal, which allows you to read/write/edit/delete calendars hosted by third parties like Google Calendar. 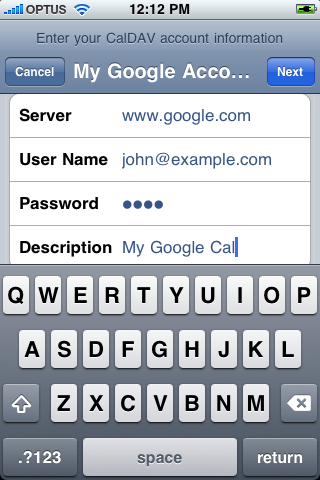 Similar functionality was available on the iPhone, but only via Apple’s MobileMe service. 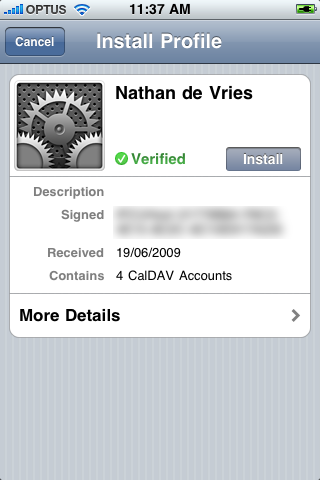 That’s changed with iPhone OS 3.0. If you’ve configured a bunch of CalDAV calendars in iCal, unfortunately they’re synced to the iPhone as read-only calendars which is a real pain. In lieu of a fix by Apple, we’ll need to remove the iCal CalDAV accounts from the iTunes calendar sync list, and configure them on the iPhone itself. If you’ve got multiple CalDAV calendars, it starts to get a little bit hairier. 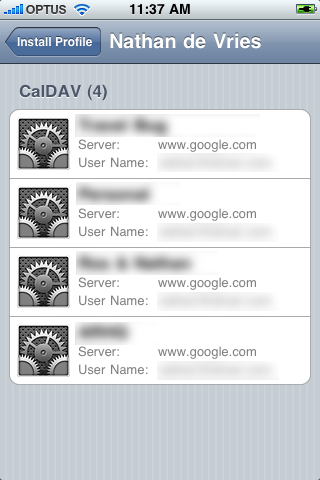 Initially, I emailed myself a list of my CalDAV URLs (4 in total) and used the new copy-paste features to manually configure each account using the previous instructions, only instead of using “www.google.com” in the server field, I pasted the entire CalDAV URL instead. As you can imagine, this is incredibly tedious. Fortunately Apple also released a new version of the iPhone Configuration Utility (ICU), which is a really handy tool for creating iPhone configuration bundles for deployment in enterprise environments. 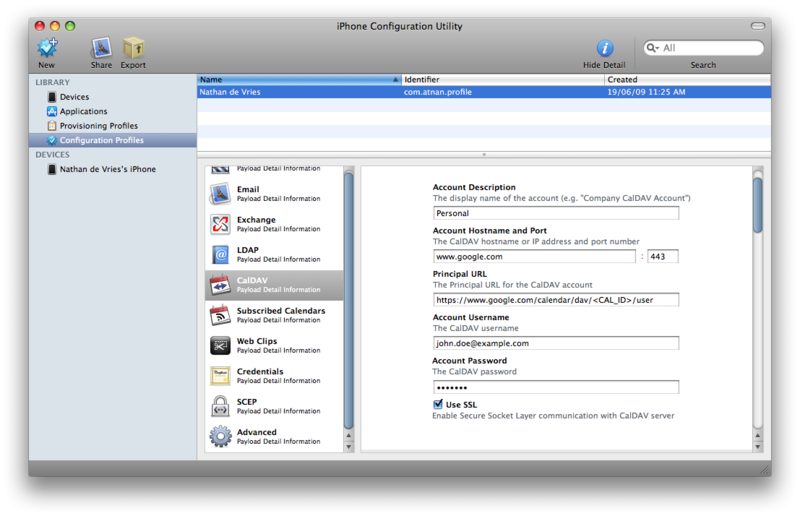 Among other things, this new version allows you to configure CalDAV accounts. If you haven’t already, you should grab a copy of ICU for Mac OS X or Windows. If you’re looking at the Principal URL field and wondering what is, you’ll find it in the calendar settings page of Google Calendar under Calendar Address (it should look like an email address). Once you’ve entered all your CalDAV accounts, plug in your iPhone, select it in ICU and open the Configuration Profiles tab. You should see the configuration profile you just created, with an “Install” button next to it. Hit the “Install” button. Hit “Install”, confirm, and open up the Calendar App to see if everything works as expected. You should be able to create, edit and delete calendar entries in your CalDAV accounts, and have them update in iCal / Google Calendar. If you ever want to add a new CalDAV calendar, I think you need to remove the configuration via the iPhone Configuration Utility and re-install the edited configuration bundle. Hopefully it doesn’t take too long for Apple to make the CalDAV integration between iCal and the iPhone more seamless.